We offer Targeted Grazing a natural approach to vegetation management and landscape enhancement. We supply Electric Solar powered fencing. Goats are a great source for managing fire risk, and making foreclosed homes look presentable instead of having overgrown grass etc. 2. We come to your property to assess the site to determine grazing suitability. We want to make sure our clients needs are met as well as keeping our herd safe. 3. We prepare an estimate for the selected area you want grazed. weeds to mutate and actually increase in density and endurance. 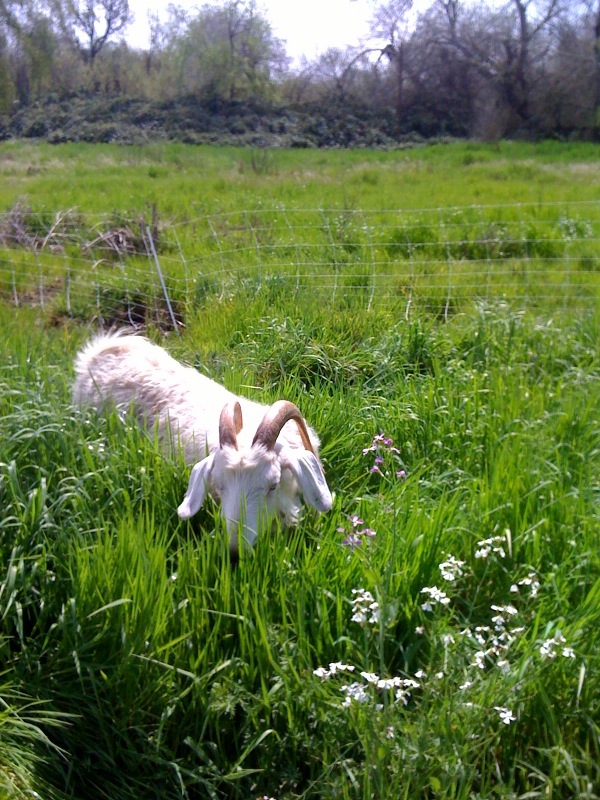 Goats prefer weeds, grasses, and brush. 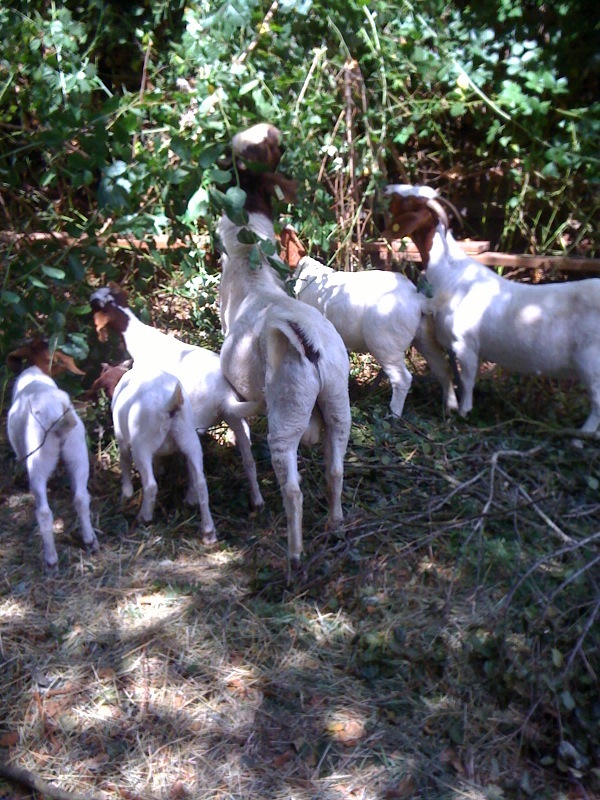 Managed goat herds snap off and consume all the flower heads, then pick off the leaves, leaving a bare stock. Because the flower is eliminated immediately, it cannot go to seed and without leaves it cannot photosynthesize and build a root system. and a list of other noxious plants that degrade both plant and animal habitats. Goats provide a practical method for the reduction and mitigation of invasive plants including the extensive list of non -native thistles which degrade habitat and spread prolifically. What makes the goat a superbly effective tool in the reduction and elimination of thistle infestation and monocultures, is the ruminant animals ability to both reduce seed production, alter soil chemistry and finally, the ability kill the plant altogether. First, how does a goat reduce seed production? Grazers target plant seed heads as they contain the highest nutritive value for the animal. If a plant has produced a seed head the goat will find this part of the plant most palatable, and consume it first. Second, How does a goat effect soil chemistry, and why is this advantageous? Through the elimination processes goats alter both soil ph and N, K, P levels. Certain varieties of thistle thrive under certain conditions; for example—Italian Thistle, a resilient invasive annual thistle prefers potassium deficient soils. Understanding the unique/peculiar preferences of invasive/undesirable plants allows insight into intensity and duration of grazing application, as soil dynamics can be changed through animal impact so as to promote specific conditions, favorable or unfavorable to different plants and microorganisms. Finally, and most essentially, a grazer can kill a plant. The mechanical process of grazing can destroy a plants ability to deliver nutrients to itself, to photosynthesize and can damage a plants ability to derive a store nutrients and water from itself and the soil. It is because the grazer works on multiple biological and physical levels that grazing is effective. What’s more, is a grazers ability to stimulate desirable ecological conditions such that soil, plant community and hydrological conditions are conducive to balance. 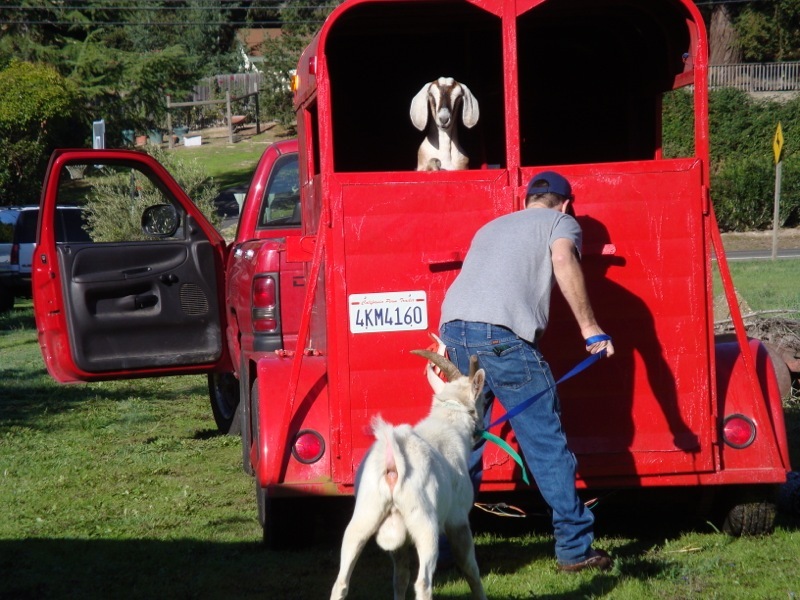 Billy the founder goat supervising his employees. It all started with Billy who we adopted as a baby because his mother didn't produce enough milk so we crate raised him in our home and then decided wow Billy needs a family he is way too big to be in our home so we then bought a pygmy mommy and baby who became his sister and mother. 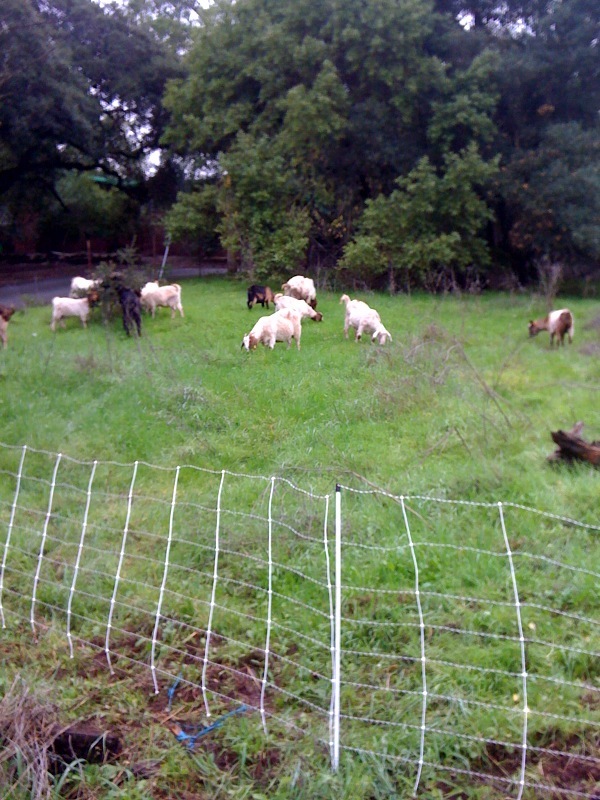 One day our neighbor said hey do you rent your goats out for grazing and the rest was history.